If you're having trouble receiving some channels in digital, try performing what's called a "double rescan." First, remove the coaxial cable from your antenna that is connected to your converter box. 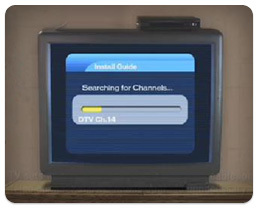 After removing it, scan for channels by selecting "auto tuning", "autoscan" or "EZ scan" using the converter box menu. Once the scan without the antenna is complete, turn off and then unplug the power to your converter box for a minute or two. This performs a "reboot" of your converter box that will help clear any former channels from the system's memory. Once that scan is complete, re-insert the cable from your antenna back into the converter box input. Then use the converter box menu again to scan for channels. When this second scan is complete, you may get more channels than you previously received.